This brief report describes a scenario design exercise undertaken to study the future evolution of the sustainable development paradigm and its possible implications for the Spanish development model. For this purpose, three scenarios were built for a time horizon extending to 2025, displaying possible alternative economic, energetic, technological and environmental contexts. Finally, scenario implications were determined for the social, economic, territorial and governance models in the Spanish context. Is Spain Ready for a Sustainable Lifestyle? Since the Brundtland Commission defined sustainable development (SD) as “the ability to meet the needs of the present without compromising the ability of future generations to meet their own needs” (WCED, 1987), this concept has gained universal acceptance among the general public. Moreover, a growing number of socio-economic and political agents are said to be conscious about the need of pursuing more sustainable urban development. However, the relative novelty of this concept and the fact that it has only recently gained widespread social acceptance have not yet permitted to assess with rigour the reciprocal relations that might develop between the sustainable development paradigm and general behaviour in society. Although nowadays many public administrations and private companies are assessing the implications of sustainable development in their daily activities with more or less intensity, there is not much relevant research about future citizen behaviour toward the SD concept. The lack of studies on this issue may be explained by two major difficulties: unmanageable complexity and high uncertainty. The first difficulty is due to the diverse and complex behaviour of social groups toward sustainable development in their daily or sporadic vital activities. This level of complexity is aggravated by the fact that the sustainability paradigm also influences and transforms patterns of social behaviour. In other words, we are faced with a circular relation where social attitudes affect sustainable development while the paradigm in turn induces certain types of social behaviour. We must therefore recognise the unquestionable difficulty of assessing the impact of the concept of sustainability on our development models. The second difficulty refers to the existing high level of uncertainty whenever the future evolution of social behaviour is to be predicted with regard to the sustainable development issue in advanced and prosperous societies. Even if we know the principles and values that presently guide the vital functions of social groups in a certain territory, they can fairly easily change in a short period of time, breaking with historical patterns. Additionally, there is a tendency to ignore the future evolution of environmental factors such as climate change or the availability of energy resources, which surely will significantly influence social behaviour. Therefore, any attempt at anticipating a single and officially accepted scenario of the future of socio-cultural behaviour patterns, economic systems, governance models, and land use patterns in contemporary societies suffers from a lack of plausibility. What Business Opportunities Can Sustainability Bring? (3) to identify new business opportunities involved in providing goods and services related to the concept of sustainability. From the existing foresight tools, scenario design was chosen to carry out this research project because it most adequately allowed taking the complexity and uncertainty of social behaviour toward sustainable development into consideration while it at the same time enabled unfolding alternative futures. A scenario may be defined as a tool for arranging perceptions of the future, thus helping to shape an outlook with a wide perspective in a world of great uncertainty. This foresight technique is eminently qualitative; it combines intuition and rational analysis, and it usually requires the collaboration of a group of experts. 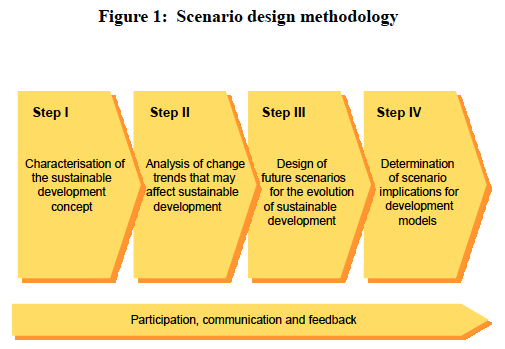 The chosen method for this foresight exercise was organised sequentially in four stages (see Figure 1): (1) characterise the sustainable development concept; (2) identify and assess the most relevant change trends that may affect sustainable development; (3) design future scenarios for the evolution of sustainable development; (4) determine scenario implications for development models. This approach rested on an ongoing and systematic process of participation and evaluation by experts in areas related to sustainable development. In the course of the study, more than 30 experts from private companies and public organizations participated in assessing trends and determining the implications of scenarios for the sustainable development model. Expert involvement either took the form of personal interviews or participation in focus groups. 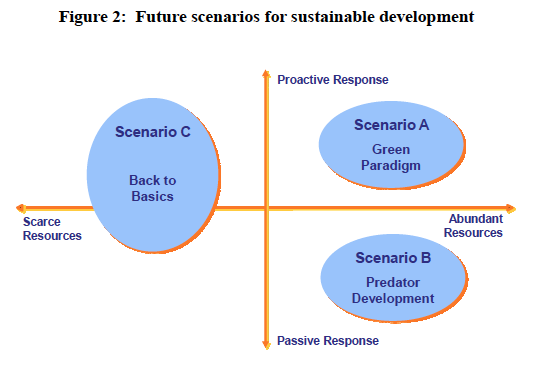 The vertical axis represents possible alternative responses of society to the concept of sustainable development in the future. This axis encompasses all future uncertainties related to social behaviour, economic models and public policies toward SD. The horizontal axis shows the availability of resources to achieve the goals of sustainable development in the future. This axis includes all critical uncertainties regarding the abundance or scarcity of technological, economic, human, institutional and natural resources. In the space defined by those axes, we can identify three distinct scenarios, which pose a number of challenges to the Spanish development model (see Figure 2). Scenario A: Green Paradigm (circa 2025). This scenario can be expected when, on the one hand, there is a proactive and favourable response from public and private agents toward SD and, on the other, there are abundant resources of all types to achieve sustainable development. “Green Paradigm” assumes an environmentally conscious society in which most citizens participate in public decision-making. Spanish society would have to meet a number of challenges in order to prosper in this scenario. First, an education system capable of promoting sustainability, innovation and solidarity values is required. Second, a diversity of new social demands of a very heterogeneous population have to be satisfied but without risking sustainability principles. Third, an economic model based on respect for the environment and supported by responsible consumption must be developed. Fourth, measures promoting cooperation between business and government must be implemented in order to make an easier transition toward less polluting and more eco-efficient technologies. Fifth, mobility patterns have to be transformed by applying technological innovations to transport systems. Sixth, an advanced and transparent governance model is required favouring citizen participation, co-ordination among different administrative levels and public-private co-operation. Seventh, planning and implementing advanced territorial policies are needed that support Spanish society in developing toward more sustainable arrangements. Eighth, management of companies and public bodies must be improved so that they internalise environmental costs by applying sophisticated environmental evaluation tools. Scenario B: Predator Development (circa 2025). This scenario unfolds in a context in which resources of all types are abundant, but at the same time public and private agents are either slow or passive in reacting to sustainability challenges. “Predator Development” represents a society that disregards environmental issues as not critical compared to its economic and consumption needs. The successive emergence of technological innovations seems to conjure away environmental threats and tends to relax a society indulging in exuberant consumerism. Scenario B challenges underline the need to correct the strong environmental and social impacts generated by an economic model based on a philosophy of growth. First, formulas need to be established for satisfying social needs in an environment where individualism and intolerance prevail. Second, an ample array of products and services must be provided to facilitate day-to-day tasks in a society geared toward a culture of rapid change and instant satisfaction. Third, Spanish companies must be competitive enough to successfully operate in global markets. Fourth, the Spanish economy’s dynamism has to be fed by providing abundant and inexpensive energy sources. Fifth, effective technological innovations have to be developed to take full advantage of nuclear energy and to exploit coal reserves. Sixth, strong demand for passenger and goods mobility must be accommodated by construction of new transport infrastructures with low environmental impact. Seventh, public administrations need to make widespread use of new technologies to guarantee transparent decision-making, streamline administrative procedures and facilitate citizens’ access to public services. Eighth, effective legislation in the field of urban development is required in order to counterbalance real estate excesses. Scenario C: Back to Basics (circa 2025). According to this scenario, there is a significant shortage of all types of resources due to a prolonged recession, but, at the same time, Spanish society as a whole is inclined to support sustainable development models. “Back to Basics” elaborates a scenario of failure of the current development model that leads to social tension and frustration. Scenario C confronts Spanish society with a number of challenges that call for a radical transformation of the old development model. First, new initiatives must be launched to restrain immigration flows by promoting development in third world countries. Second, family structures and other social networks have to be reinforced to counterbalance the negative effects of the economic crisis. Third, a new education system must be set up to foster new social and environmental values. Fourth, commercial marketing has to be aligned with new social and environmental values. Fifth, strong structural measures have to be adopted to get the economic system on track toward a more sustainable paradigm. Sixth, energy consumption per capita needs to be reduced by changing patterns of demand. Seventh, a clear and strict normative framework needs to be established forcing companies and public bodies to internalise environmental costs. Eighth, a strong government with broad public backing must be formed to implement effective policies against the economic and environmental crisis. Ninth, citizen participation and co-ordination among public administrations must be required by law and be additionally supported by public pressure. Tenth, joint action by public administrations, the third sector and the private sector are needed to cover growing social needs provoked by a systemic crisis. This foresight exercise on the future evolution of the Spanish sustainable development model has produced some interesting findings from the point of view of development policies. Climate scenarios must be designed to anticipate and discuss the possible impacts of climatic change on the country’s key economic activities, such as tourism, construction or the automotive industry. Technology’s capabilities of solving future environmental and energy problems must be assessed with rigour and realism. Strategically comprehensive and multi-sectoral territorial plans must be elaborated for achieving sustainability with a wide scope. All public administrations – European, national, regional or local – must assume responsibility and make a profound commitment to implementing sustainable development at their level of authority. Social consciousness and collective intelligence toward sustainability must significantly increase if social-cultural and consumption behaviour is to be changed in the desired direction. In brief, Spain faces a big challenge to change social and cultural behaviour toward sustainable development, which involves improving citizen education and providing more information on the issue. Meeting this challenge implies significant changes in our day-to-day habits as in our governance and business models. Nevertheless, these changes will create new economic, social and environmental opportunities for Spanish society as a whole. Fernández Güell, José Miguel (2006). Planificación estratégica de ciudades: Nuevos instrumentos y procesos. Barcelona: Editorial Reverté. Fernández Güell, José Miguel (2004). El diseño de escenarios en el ámbito empresarial. Madrid: Editorial Pirámide. Fundación OPTI y Valora Consultores (2007). Estudio de prospectiva sobre el comportamiento social ante el desarrollo sostenible. Madrid: Ministerio de Industria, Turismo y Comercio.